The dedicated and motivated duo draw inspiration and different perspectives from western and eastern history, interpreting the rudiments of architecture and assimilating them into a singular, multi-cultural design-language. If you’re interested in sustainable architecture, Penda’s Rising Canes project, developed for Beijing Design Week in 2015 is breathtaking. The modular pavilion system is based on a triangular template construction ranging from tiny singular houses to multi-residential emergency shelters and hotels. 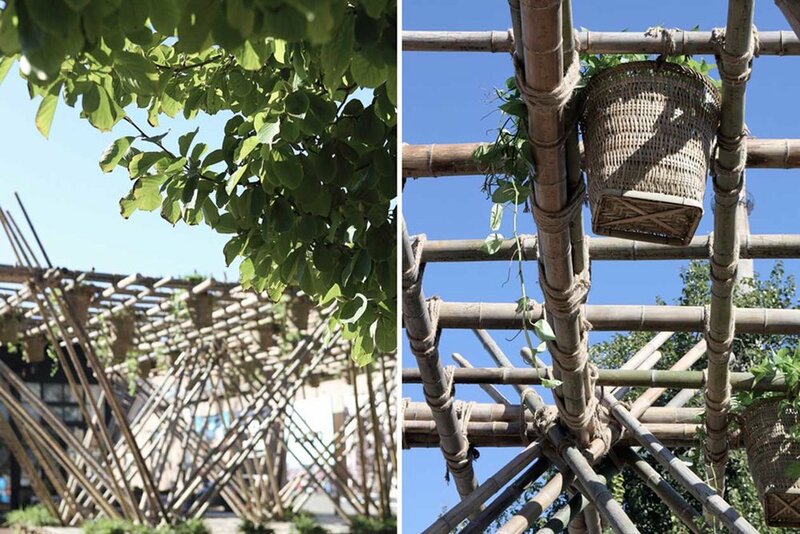 The pavilions are made from 100% recyclable materials like bamboo and ropes without the use of nails or screws. Think of it as a more sophisticated and beautiful translation of Asian building-site bamboo scaffolding and you’ll get the picture! The initial structure is assembled into a simple housing unit that could accommodate one family. It includes outdoor spaces and is filled with plants for shadowing and food production. 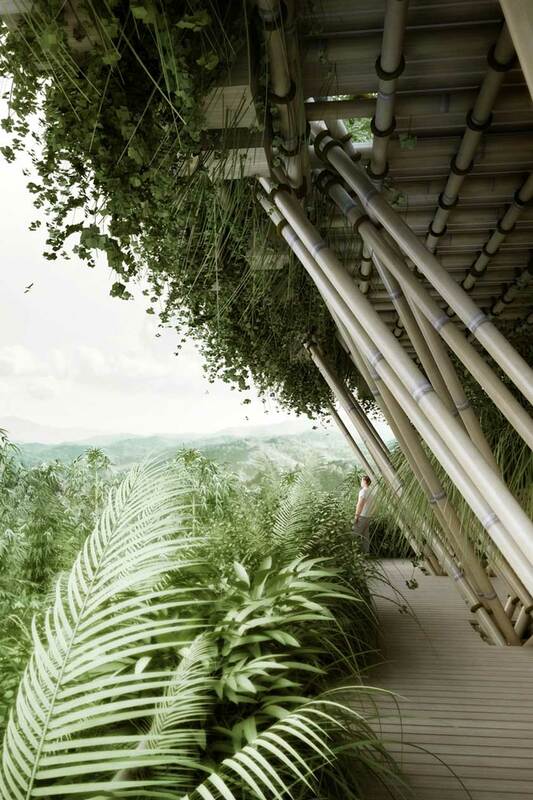 The designers have planned a system whereby when bamboo canes are taken from the seeded bamboo plantation to put into the structure, there has to be two new plants for every cane harvested, so it empowers a resource for the structure and also a living natural environment. When the number of inhabitants increase, the structure is able to replicate itself and grow, creating community spaces and areas for food production are extended accordingly turning the structure into a self-sufficient habitat. The model can keep on growing and expanding as needed into a continuous, yet diverse structure, that accommodates multiple families and a variety of communal spaces and facilities. Not only provide a stunning visual aesthetic, it is an amazing inspiration and sustainable conversation starter that can, and probably already has, changed the way we approach construction and the greenification of the urban dwelling for tropical climate regions. One of the fastest growing, renewable resources in the world. It absorbs CO2 in large quantities. Throughout history bamboo has been used traditionally as a building and scaffolding material, for medicinal purposes, as food and for the production of everyday implements. These days you will find bamboo as a material broadens to further applications such as paper, clothing, towelling, bedlinen, furniture, kitchenware, and flooring (as a substitute for hardwood timber). 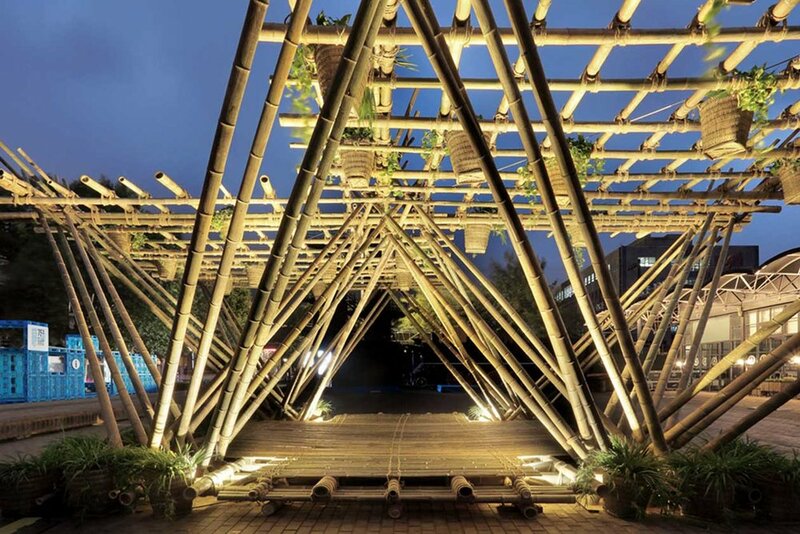 Bamboo is said to be 2-3 times stronger than a steel beam of the same weight, due to its exceptionally high flexibility, it is the ideal material for earthquake-safe buildings. Bamboo is one of the fastest growing plants in the world. It can reach its final length of up to aprox 20 meters within a couple of months. Some species can grow up to 1 meter or more per day. One plant consists of several poles and new shoots will grow from the mother plant every year. Generally 20-25% of the poles in a sustainable bamboo plantation can be harvested each year. This happens without decreasing the number of poles per hectare and of course the plant does not die after harvesting, as with trees, so no deforestation occurs! In fact, by harvesting the mature plants, the plantations actually increase their yield and quality. It’s a win-win situation all round. For all things Penda visit their website here.